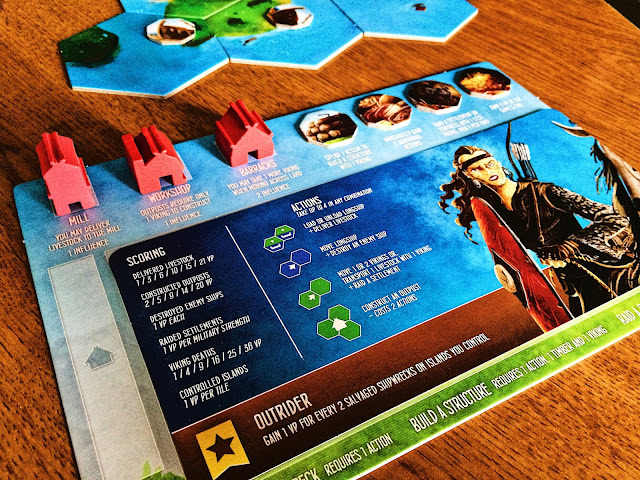 WARNING: This is a review of an expansion for the game Explorers of the North Sea. We will only be covering what is added or removed by this expansion. Rocks of Ruin, the second expansion for Explorers of the North Sea, brings us some exciting new areas to conquer, along with slew of new tokens, tiles, support for a fifth player, new building types, and player boards! You thought Explorers was already great? Just wait until you add these in the game! Setup for the game with the expansions adds only a few changes. Each player will have a new player dashboard, meant to help keep track as the game moves along. Have each player place their Outposts, Mill, Workshop, and Barracks on their dashboard. 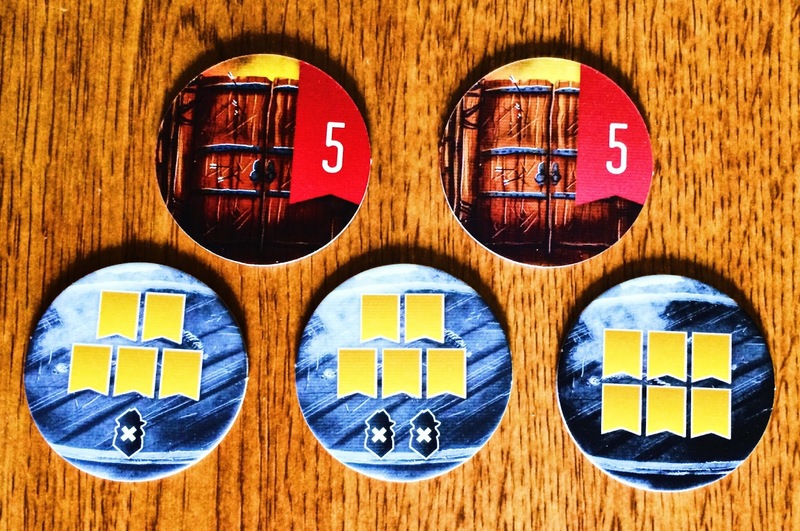 With the addition of the Fortress tokens (5 total) and Shipwreck tokens (24 of these), you’ll be shuffling them and placing them in separate piles next to the starting board. Shuffle all the tiles (original 48 plus the 24 new tiles) together and deal each player three. Turn over the top three tiles and place then next to the stack of remaining tiles. Now shuffle all the Captain cards (the expansions adds three more cards) and deal two to each player, allowing the players to choose which one they wish to keep. Setup is now complete. The rules for the new tokens follow the same logic as in the base game. When a tile is placed, it may have an illustration indicating that either a Shipwreck or a Fortress token should be placed on it. Take one from the pile and place it face down on the tile. These would remain face down until either salvaged (for the shipwreck) or raided (for the fortress). With this comes three new actions being available for the players: salvage a shipwreck, build a structure (requiring one timber), or raid a fortress. Shipwreck tokens also give you additional abilities once they are turned over. Timber is required for building a Mill, Workshop, or Barracks. Provisions will give the player two additional actions when it is discarded. Siege Weapons can be discarded when raiding to use one less Viking than required. And Gold is stored until the end of the game, giving the player 3 VP for each gold they have. Finally, we have three new structures available, allowing for new abilities. The Mill allows players to unload livestock to it, the Workshop allows for all future outposts to be built with only one Viking, and the Barracks allows for movement of an additional Viking over land. It may seem like a lot, but that’s where that dashboard kicks in. 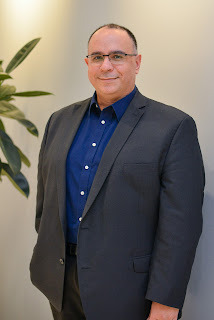 It shows you all the actions, abilities and information for everything you need to know. With the center area made to hold your player card, this is a fantastic addition to the game. But what about the Runesaga expansion? No worries! 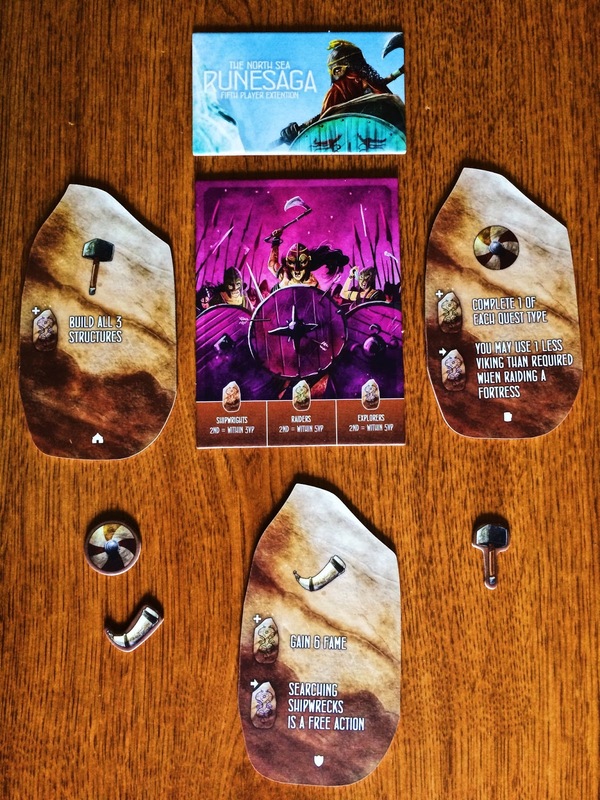 Rocks of Ruin included an expansion to add the fifth player in it. Three Runestones, three more Inscription tokens (shield, hammer, and horn), and a fifth player board, along with a card detailing how to incorporate these, all come with the expansion. 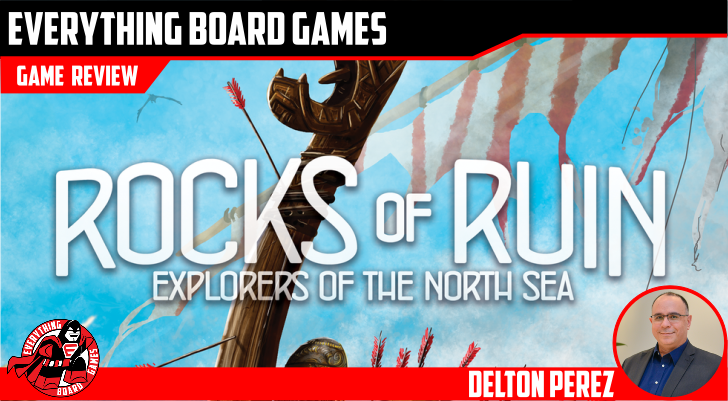 Rocks of Ruin continues to bring the theme to Explorers of the North Sea, expanding the game in appropriate ways. With the new tokens and buildings, you will see the world grow and the players become more deeply immersed in the game. 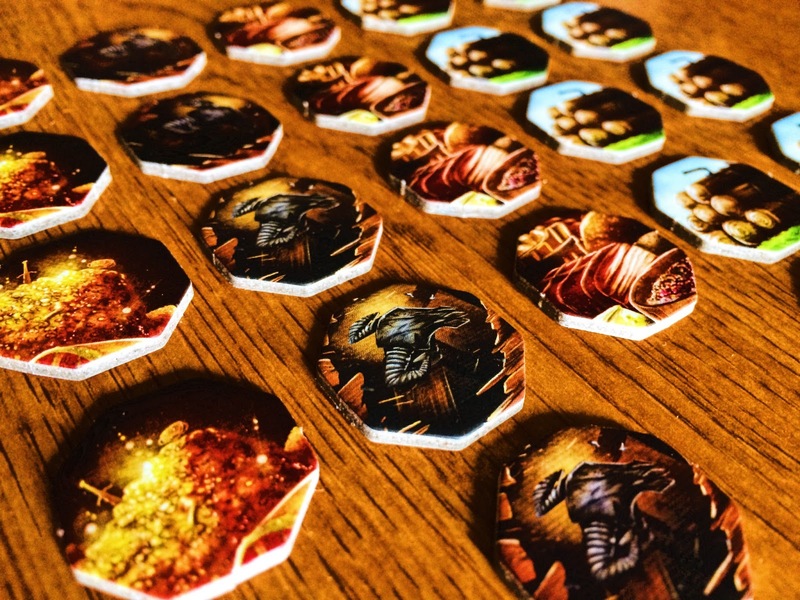 Mechanically, the game continues to run as smoothly as the original game did, with some minor tweaks due to the new buildings and powers of the tokens. Gameplay is so incredibly smooth with Rocks of Ruin. After just your first game with this, you’ll never think of playing without it. The addition of the buildings, if not for the dashboard, does make you plan a bit more in where you’ll be placing them, but with the large number of shipwreck tokens now hitting the table, you’ll want to make sure you take advantage of the exploration and try to turn these over before the other players. And let’s not forget that the game now supports five players! While this may add a little more time overall to the game, you’ll find yourself doing a little more planning to make sure you are able to take advantage when your turn comes about. The artwork and component level matches the base game’s art theme perfectly. 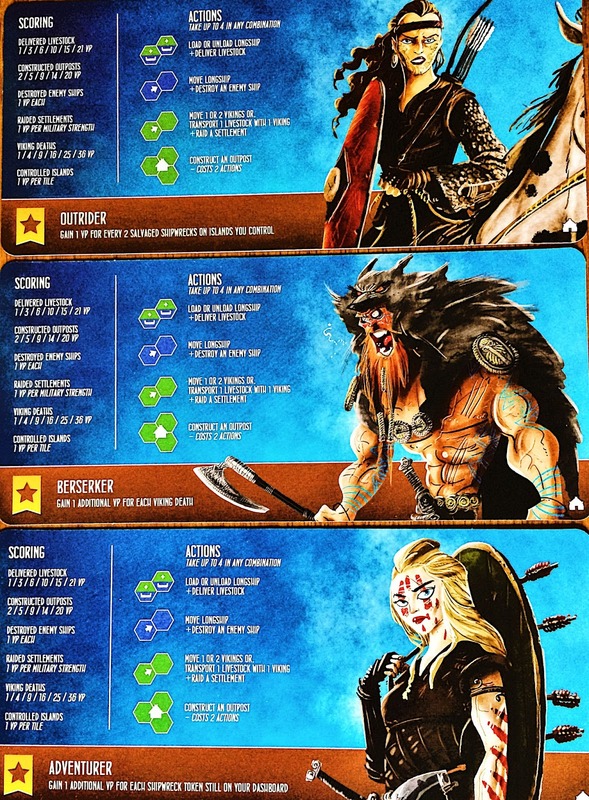 It uses solid, thick cardboard with bright blues, tokens that are clear in identifying what they represent, and as always, great components; this meets the expectations you expect for this game and from Renegade Games as a whole. More! More players supported, more actions, more buildings, more tiles! Really, the game grows wonderfully with this expansion. 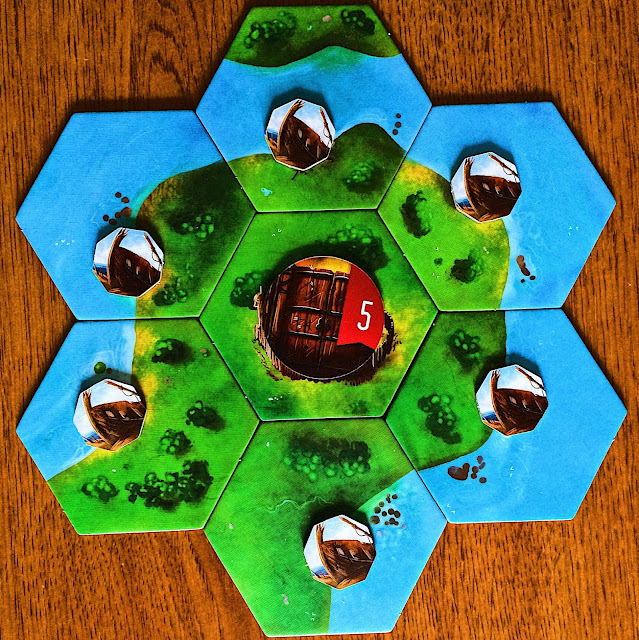 Even if you’re not adding a fifth player to the game, the addition of the tiles and new buildings just adds so much more to the game; you’ll likely find yourself thinking and strategizing before your turn. A lot more player interaction will happen, and the time will just fly by. Adding the fifth player will add some extra time between turns, with the sweet spot still being 3-4 players. If you enjoyed playing Explorers of the North Sea, then Rocks of Ruin is a must-have expansion! This is what it means to make an expansion, where you’re just adding more to a great game without impacting and changing how it feels. 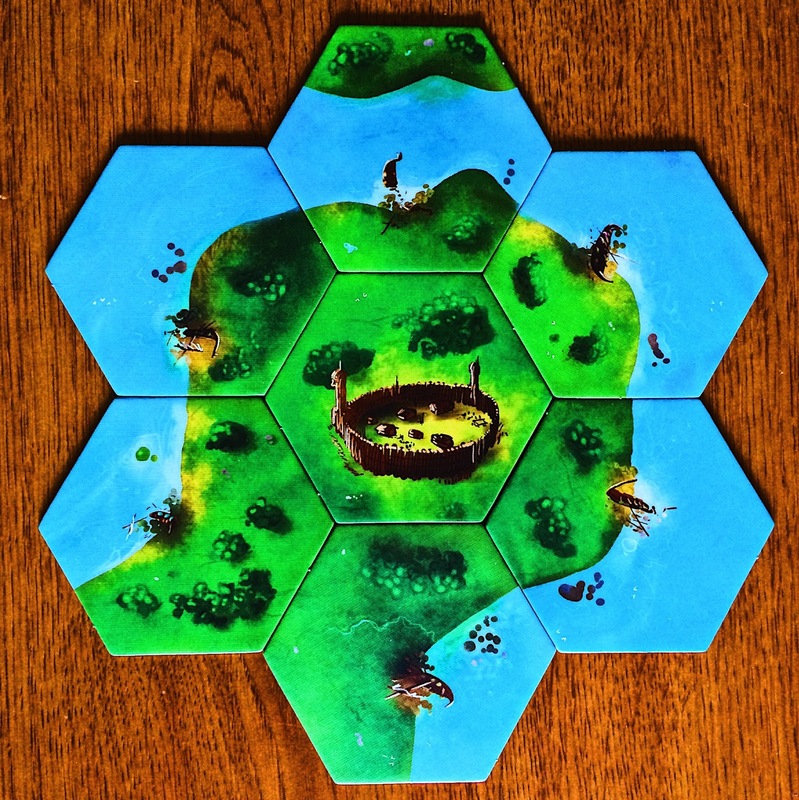 With the addition of tiles and buildings, and the need to play a little more in advance, you’ll see this hitting the table more and more.